Mission: To establish systems, processes, and culture that helps us continuously build our Intellectual Capital. Knowledge Management (KM) at Supportian allows Supportian Minds to tie together the collective experiences and knowledge towards better service delivery, organizational excellence and talent transformation. An established KM Corporate Function is responsible for globally overseeing all the activities related to KM systems, processes, structure, and policies. Supportian’s approach to KM is holistic, and unlike traditional approaches, it is not focused solely on a technology solution. Instead, we believe KM to be a socio-technical approach, powered by a knowledge culture. The key areas of KM in Supportian are innovation, sharing/collaboration, and reuse. Our culture resonates with our goals to create an open and transparent organization in which knowledge is created and shared in a supportive environment where creativity and innovation are highly valued. Supportian Minds are encouraged to bring forward any idea for improvement or innovation. To create sparks of innovation, we encourage various means of self-expression such as blogging, creative writing, painting, poetry, etc. The GALIS framework below illustrates the knowledge cycle that is supported by our KM approach. 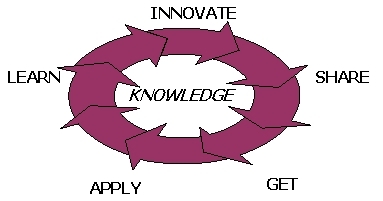 The knowledge cycle outlines how each Supportian Mind Gets, Applies, Learns, Innovates, and Shares knowledge through various socio-technical means. Our people policies also are aligned with a robust reward and recognition program for key contributors, be it content generation, championing Knowledge Communities, or filing for a patent. Supportian currently has over 25 Knowledge Communities covering various technical, non-technical, and business domains. These Communities provide a platform for knowledge sharing at a practitioner level and in the long run building overall organizational capability. An average of 35 Community events take place each month. To support the knowledge needs of each Supportian Mind, we have internally developed and deployed various systems to enable collaboration between Supportian Minds and give them quick access to knowledge. This includes a centralized knowledge repository, a collaboration platform used for Community-specific and project-specific collaboration, and a platform for collaboratively creating Supportian Intellectual Property and enabling software reuse. Our internal physical environment creates a vibrant and dynamic ethos where self-expression is encouraged. The interiors are richly splashed with the colors of our visual identity, with each color representing a DNA element (Imagination, Action, and Joy). Digitized images conceived by the children from the Spastic Society of Karnataka adorn the walls and enough attention is given to community space. In our Bangalore West Campus, proximity to nature is intended to spark original creative thinking. Innovation at Supportian starts with our DNA element of imagination. Supportian Minds are trained in a variety of lateral thinking and creativity techniques such as DeBono’s Six Thinking Hats, Mindmapping, TRIZ, etc. There are regular drives for ideas from Supportian Minds with awards for the best ideas and best implementations. Supportian’s knowledge culture and knowledge workplace are all meant to cultivate the creativity in each Mind. Even a Knowledge Community focused on innovation exists within Supportian, which regularly practices, experiments and endorses various creativity tools and techniques.